All the spells for bringing someone back to you need hair from the person who has left. How are you supposed to get hair if the person won’t talk to you is gone? 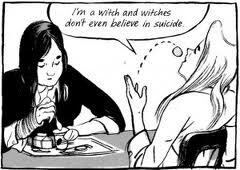 Witchcraft=total crap. It is my pleasure to introduce you to Skim. Her full name is Kimberly Keiko Cameron, and she goes to a private girl’s school. In this pensive gem of a graphic novel, Skim describes, diary-style, what happens in her school when the ex-boyfriend of her classmate commits suicide. Grief counselors visit the school, the popular girls form the Girls Celebrate Life club and Skim observes it all. You know, that’s the plot, but I feel like just describing it doesn’t do this book justice. Honestly, the suicide actually is more of the backdrop: the real focus is Skim’s personal musings. She reads her tarot cards, tries to cast Wiccan spells, negotiates relationships, and struggles with falling in love with an older woman. 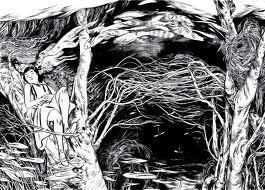 All of this understated teenage angst is exquisitely complemented by Jillian Tamaki’s incredibly graceful black and white drawings. The language is simple, almost verging on sparse, but in combination with the graphics, this is a phenomenal work. It is perfectly evocative of the quiet trials of being a teenager, the feeling Skim describes as feeling “like I have wings but my bones are bricks”. Please, please read this book. When you’re done, pass it on to someone else. I’m putting it on my Best Ever list right away. Tamaki, Mariko and Jillian. Skim. Toronto: Groundwood Books, 2008. 142 pp. Ages 14 and up. 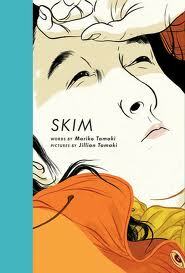 If you like this book, try Fun Home: A Family Tragicomic by Alison Bechdel, or Indoor Voice, by Jillian Tamaki. Ok, I can’t resist: one more picture! 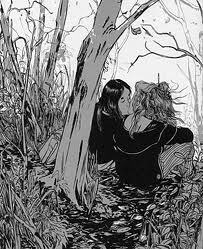 Posted on April 22, 2011 April 22, 2011 by ShannaPosted in GLBT, Graphic Novel, Realistic Fiction, YA Lit, YALSA Best Graphic NovelTagged black and white illustration, coming of age, divorce, GLBT, graphic novel, suicide, teenage angst, Wicca.